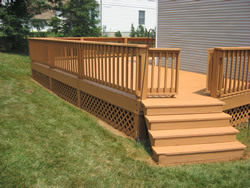 The original Dr. DecknFence® renewing Decks, Fences, Stairs, Furniture, and more since 2007! The first outdoor refinishing company to offer our clients a warranty. How do we do it? By using proprietary specialized green solutions, professionally trained and certified technicians, and sealing and staining at the same time, we bring back your outdoor wood to near new condition.